A sweltering summer’s day, January 1914: the charismatic and ruthless Adam Fox throws a lavish birthday party for his son and heir at his elegant clifftop hotel in the Blue Mountains. Everyone is invited except Angie, the girl from the cottage next door. The day will end in tragedy, a punishment for a family’s secrets and lies. In 2013, Fox’s granddaughter Lisa, seeks the truth about the past. Who is this Angie her mother speaks of: ‘the girl who broke all our hearts’? Why do locals call Fox’s hotel the ‘palace of tears’? Behind the grandeur and glamour of its famous guests and glittering parties, Lisa discovers a hidden history of passion and revenge, loyalty and love. A grand piano burns in the night, a seance promises death or forgiveness, a fire rages in a snowstorm, a painter’s final masterpiece inspires betrayal, a child is given away. With twist upon twist, this lush, strange mystery withholds its shocking truth to the very end. Julian Leatherdale’s first love was theatre. On graduation with a BA in Theatre Studies from the University of NSW, he wrote lyrics for four comedy cabarets, performed at the Adelaide and Sydney Fringe Festivals and Downstairs Belvoir Street, and co-wrote the book and lyrics for a two-act musical. 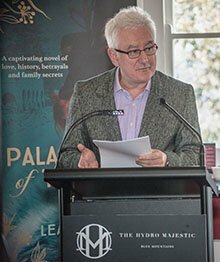 He discovered a passion for popular history as a staff writer, researcher and photo editor for the 16-volume Australians At War series published by Time-Life and John Ferguson. He later researched and co-wrote two Film Australia television documentaries Return to Sandakan and The Forgotten Force shown on the ABC and overseas. He was an image researcher at the State Library of NSW before joining The Cabinet Office where he wrote policy briefs for the NSW Premier. For some years he was the public relations manager for an international hotel school in the Blue Mountains where he lives with his wife and two children. 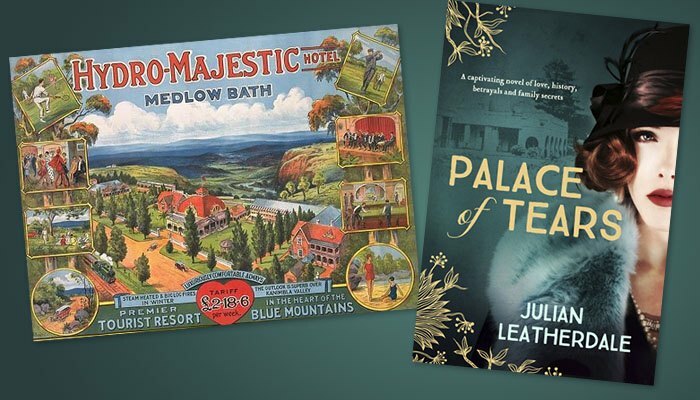 Author Julian Leatherdale reveals two fascinating historical stories that he uncovered while researching his novel Palace of Tears; the strange tale of the Hydro Majestic hotel and the shocking reality of German internment during WWI. A luxury spa hotel, the Hydro Majestic was opened in 1904 in the Blue Mountains by department store entrepreneur Mark Foy. He spared no expense on lavish décor, a gallery of expensive artworks, a hydropathy clinic with a German doctor, and luxuries and mod cons such as Turkish coffee and a telephone in every room. The clinic was short-lived but the hotel itself thrived as a mecca for the rich and famous well into the 1920s and 1930s, renowned for its banquets, balls and parties and its illustrious guests. During WWI, the Australian Government interred thousands of citizens of German descent as ‘enemy aliens’ who were considered a risk to national security. The largest internment camp was at Holsworthy, near Liverpool holding 6,890 internees, most having German or Austrian parentage. The camp grew from a collection of tents to a small town of huts complete with restaurants and cafes and other small businesses.